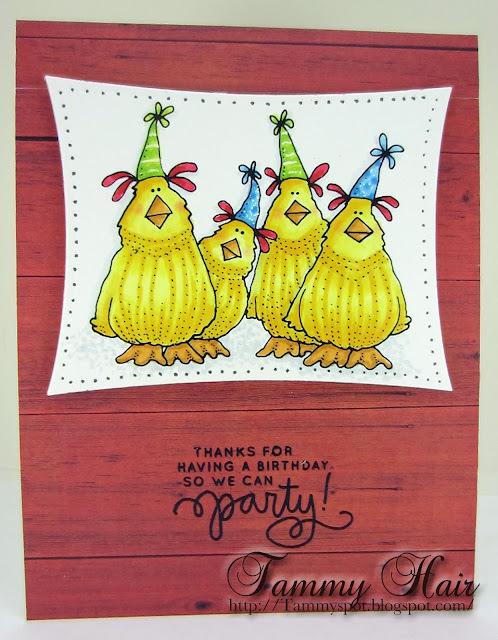 My card today features four giddy fowl ready to PA-R-T-Y! The image is Silly Birds with Hats from Hambo Stamps - Digital Image Store. This was one of the first digis I ever bought... and it's still a cracker!! Awesome, Tammy! Definitely makes one smile. Hee hee..they are fun Tammy...how can dots for eyes be so expressive?..fabulous. LOL!!! TOO fun and cute! Love those little guys and the sentiment says it all! Fabulous card, I love the fun image and beautiful colouring. Hahaha! I love it when you stamp! Always something to smile about here. Hambo has the funniest sentiments, and I've got a bunch of them. Great card, Tammy! What a great birthday card. Love the image and the sentiment!